IPL 2019: Kolkata won by 5 wickets. 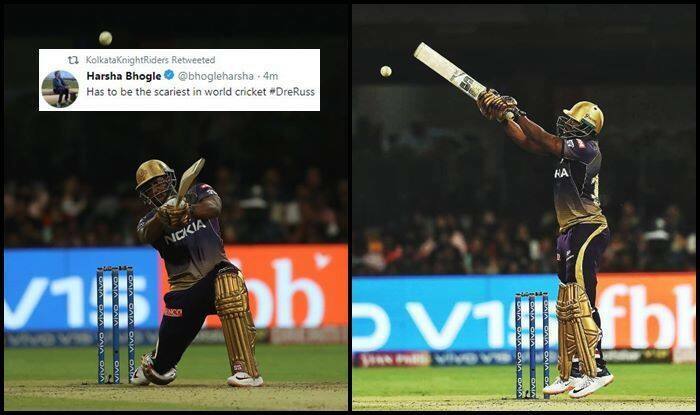 IPL 2019: Russell mania is at an all-time high! It was Andre Russell who smashed a 13-ball 48* to help Kolkata beat Bangalore by five wickets and balls to spare. Rusell came in at a stage when he had about three overs to go, and he came hard at the Bangalore bowlers. His blitz comprised of seven monstrous sixes. The 206 chase is the joint-highest on this ground. It was Russell who did the bulk of the scoring at the back end after Karthik departed. Russell is having a dream tournament where he is coming good for the Knights consistently. Here is how Twitter reacted. Russell also bagged the Man of the Match for his breathtaking knock. “Those kinds of knocks, you don’t talk much. We trust him as a player. It’s important to give him an atmosphere where he’s happy and he just keeps performing. Yeah, it was hard to play strokes against spinners with the ball gripping but was easier against the fast bowlers. I think as much as well he batted, it’s time we all started to bowl better and help the batters. It was nice to see Lynny bat like that and take responsibility,” said Kolkata captain Dinesh Karthik about Russell’s knock.